Essential Skeleton 2 received four stars. Find out about this and other apps below. Get a new smartphone over the holidays? These six time-saving, informative apps are just the thing to fill it up. Is there an app for that? If there is, you should check if it’s in GEN’s Best Science Apps first! Every month, we bring you a list of the best biotech- and biopharma-related apps we think you, GEN reader, would find useful and/or interesting. Here is our most recent list of Best Science Apps. Enjoy! Kinases play an important role in cell signaling, metabolism, and…well…basically everything. Whether for the purpose of manipulating kinase activity in the lab or for therapeutic purposes, it is useful to identify molecules that can bind to, and modulate the activity of, specific kinases. The iKinase Universal app gives users access to the Eidogen-Sertanty Kinase Knowledgebase, a database of small molecules that target kinases. 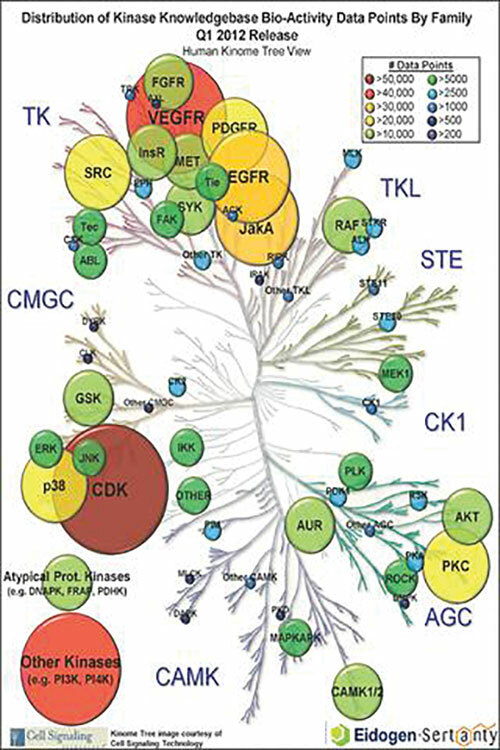 The information in the app is organized alphabetically by the name of the kinase target. 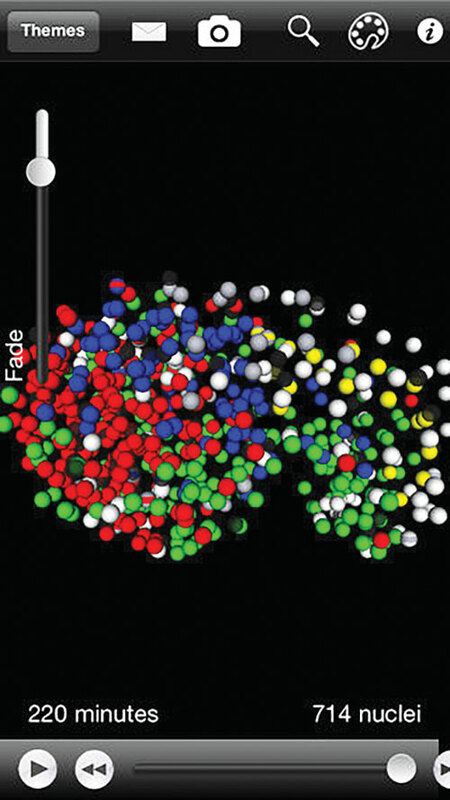 Upon selection of a kinase, users can browse the various molecules that target that specific enzyme. Brief information is given about the experiment in which that molecule was tested, and the title and complete reference to any corresponding publication is given. Clicking on the reference takes users directly to PubMed. Now this app isn’t just a skeleton app—it’s an essential skeleton app (and version two, at that). 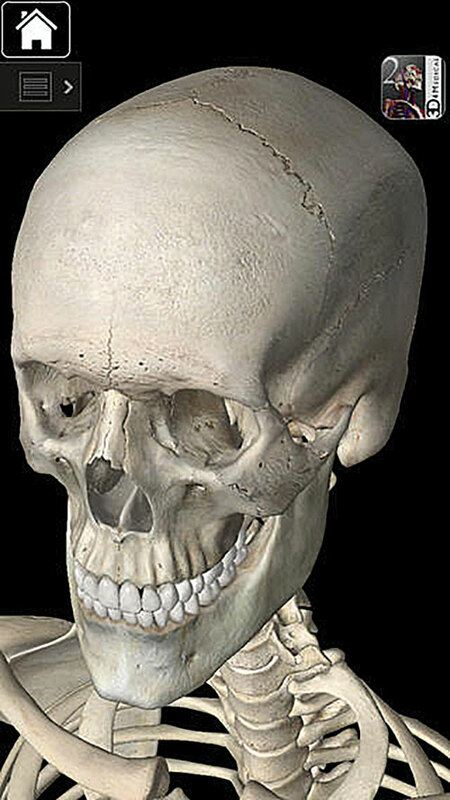 The skeleton is beautifully rendered and looks good at both low and high magnification. To begin, the help menu includes four video tutorials to get you started. Users can easily select individual bones (or, in multiple selection mode, many bones) to display their names, as well as visibility options and an audio pronunciation guide. The pencil tool allows app users to take notes directly onto the screen, after which point they can capture a screenshot of their scribbles and either save or email the image. 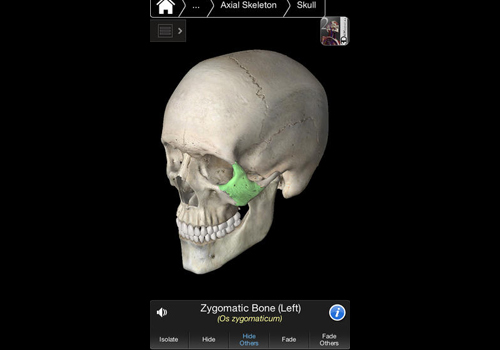 Finally—just like any good anatomy study tool—the app includes a quiz feature. Users can define the areas of the skeleton on which to be tested, and they can also toggle Latin subtitles on or off. 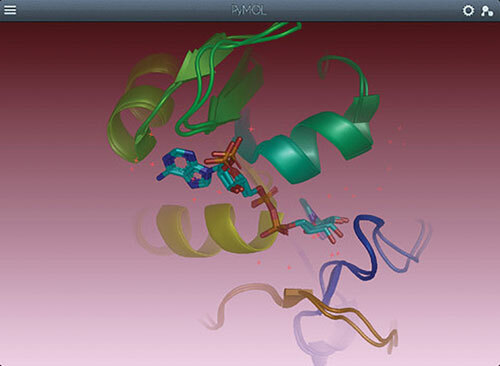 Fans of the Pymol molecule visualization program, rejoice! Pymol is now available on-the-go via the iPad app of the same name. Users can pinch-and-zoom and move molecules about the screen with ease. Whether you choose to display your macromolecule as simple line drawings, cartoons, or surface plots (among other options), the graphics update nicely and do not lag as users manipulate them. The app allows users to choose different display options for polymers, ligands, ligand sites, and solvent, when applicable. Users can download structures to view from PDB, PubChem, PyMOL Dropbox, or a custom PyMOL server by the makers of the app. Once you’ve positioned the molecule exactly as you’d like, you can take a screenshot and either copy it to the clipboard or save it to either Dropbox or your photos. The people at welovecoding.com sure are enthusiastic about computer programming—and now they want to pass the enthusiasm on to you! 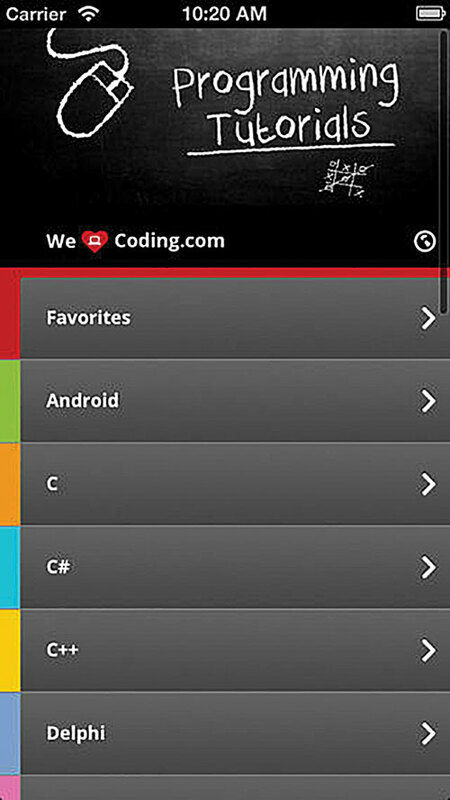 The Programming Tutorials app gives users access to a library of tutorial videos (some recorded exclusively for this app) that cover many different programming languages and platforms. These languages/platforms include C++, HTML5, Java, Linux, Python, iPhone, and Android, among others. And speaking of languages, users should be warned that while most of the tutorials come in the English variety, some of the platforms included in the app (such as Windows 7) have only German-language tutorials. However, as the tutorials videos are demonstrative in nature (e.g. a screen shot showing the cursor motions), the language issue may not be such a barrier after all…if you can follow along without a narrator. The Immunological Genome (ImmGen) Project provides gene expression data for various immune cell types in the mouse. These data are now available in iPad/iPhone format with the free ImmGen app. 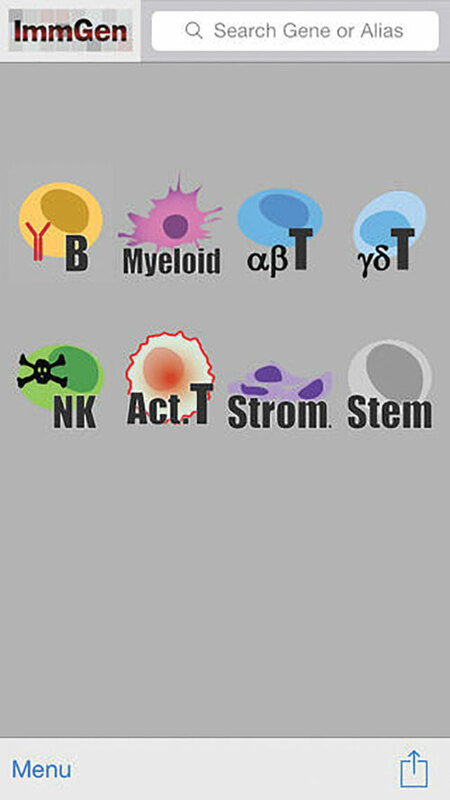 On the homescreen, users search for a gene of interest to display the expression data for that gene in seven immune cell types—B cells, γδ T cells, αβ T cells, activated T cells, NK cells, myeloid cells, and stromal cells—as well as immune precursor cells. The expression data are displayed in heat-map form for each cell type, with each box corresponding to a specific experiment. Users can select a specific cell type to bring up those data fullscreen, as a bar chart. While brief summaries of each experiment (i.e. cell sample and number of replicates) can be displayed, it is unfortunate that citations are not also provided so that users can get more detailed information about the experiments. The description of the WormGUIDES app is terse, but appropriate: “the making of a worm.” This app provides an animated visualization of embryogenesis in C. elegans, as a single cell divides to give 558 cells over the course of 337 minutes. The time course is (thankfully) sped up such that app users can observe the phenomenon in mere minutes. Importantly, the app allows users to take advantage of one of the really neat features of C. elegans development: the fact that the exact lineage for and position of each cell is known. Thus, app users can select any one of the “cells” at any point during the animation, and its name will appear. Then, in the menu for that cell, users can choose to display its ancestors or descendants (or both) as the animation progresses. The user can select individual colors to depict the ancestors/descendants of a given cell.